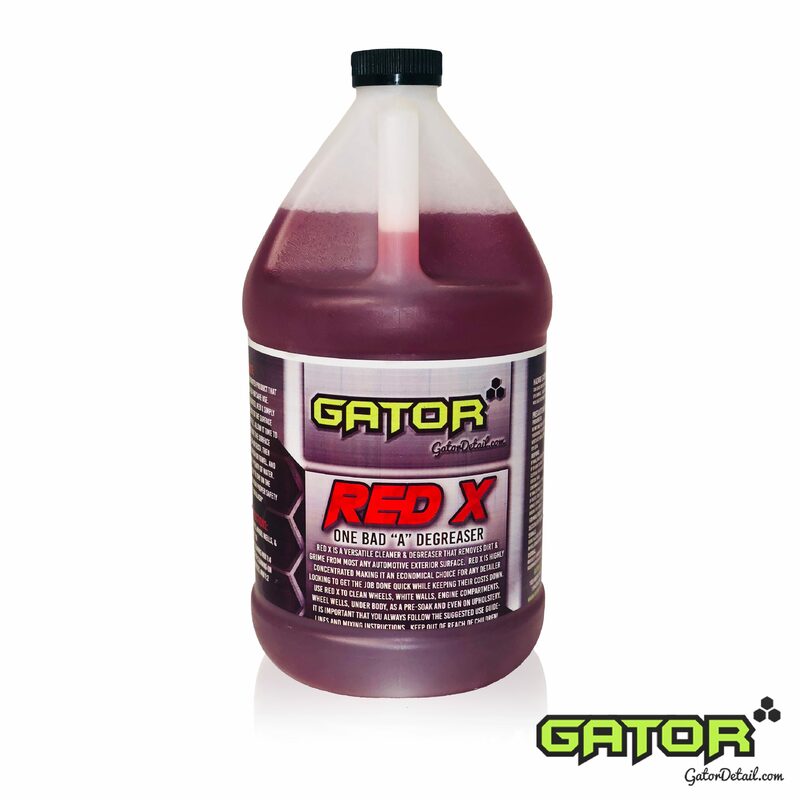 GATOR’S RED-X IS A VERSATILE CLEANER & DEGREASER THAT REMOVES DIRT & GRIME FROM MOST ANY AUTOMOTIVE EXTERIOR SURFACE. RED-X IS HIGHLY CONCENTRATED MAKING IT AN ECONOMICAL CHOICE FOR ANY DETAILER LOOKING TO GET THE JOB DONE QUICK WHILE KEEPING THEIR COSTS DOWN. USE RED-X TO CLEAN WHEELS, WHITE WALLS, ENGINE COMPARTMENTS, WHEEL WELLS, UNDER BODY, AS A PRE-SOAK, AND EVEN ON UPHOLSTERY. RED-X is a concentrated product that needs to be diluted for safe use. When properly diluted, RED-X simply needs to be applied to the surface using a spray bottle, allow it time to dwell and penetrate the surface contaminates (30-60 seconds), then agitate with a brush or towel, and finally rinse with plenty of water.